The Center for Ecoliteracy makes getting kids out of doors look easy. Much ado was made about a recent British study that found many children think tomatoes grow underground and cheese comes from plants. That’s part of the reason we now have an app that allows kids to garden digitally. It was developed by the Center for Ecoliteracy in response to the distance between today’s kids and farming. The goal is to make it engaging enough to return kids to the source of their food. But why the focus on soil instead of, say, vegetables? Through the app children are now able to plant a seed, send a microscope down into the dirt to get a close up view of what happens, and even go 500 years back in time to watch an inch of topsoil form. 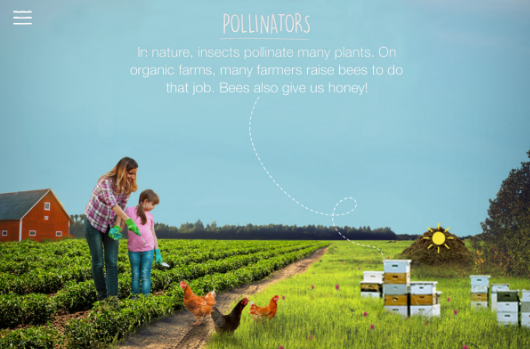 The app’s developers are encouraging kids to bring it into the garden. Takeaway: Know any kids? Introduce them to the power of dirt by downloading the free app. Who knows, it could be a first step on the path to good food activism.